Photo by Marie-Michèle Bouchard. Left to right / De gauche à droite: Widney Bonfils (SOCAN), Banx & Ranx. 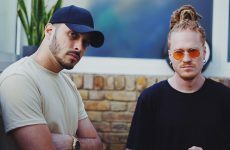 SOCAN and Pop Montréal co-presented a free Cooking Beats workshop with Montréal-based duo Banx & Ranx, and moderated by SOCAN’s Widney Bonfils, at Parc Avenue’s Rialto Theatre on Sept. 28, 2018. The duo has gained increasing traction since 2014, through their higher- and higher-profile collaborations, which were at the heart of their presentation. Indeed, it’s that very collaborative spirit that paved the way for Banx & Ranx’s success. “It’s better to have 10% in a song that’s bringing in thousands than 100% of a song that doesn’t bring in anything,” they said. The beat-making duo also shared some of their technical tips and tricks. One of them is the importance of composing beats using a cappella vocal tracks in order to give enough room to those voices, and also not being afraid of tinkering with distortion. Attendees of the workshop walked away with new production techniques, and also got the opportunity to share crucial values for social, as well as musical, well-being; respect, open-mindedness, and the collaborative spirit. 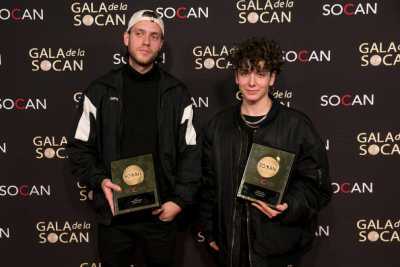 Rap sensation Loud won the Urban Music Award, as well as the Breakthrough Award – which he shared with Hubert Lenoir – during the 2018 SOCAN Montréal Awards on Oct. 2, 2018, at La Tohu. 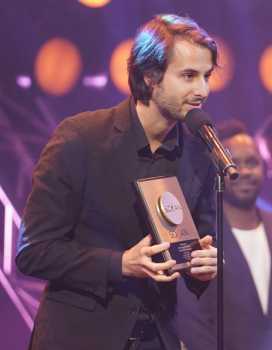 Loud also won the 2018 SOCAN Songwriting Prize last summer, with “56k.” He graced the audience with this iconic song, which became a huge hit, both in Québec and in France, and then segued into another one of his hits, “Toutes les femmes savent danser,” the first rap song to ever climb to the top of the Francophone BDS chart. It was a very special moment that we had to share with you. Photo by Benoit Rousseau. Left to right/de gauche à droite: Patrice Michaud, Eric Baptiste (SOCAN), Jim Corcoran, Éli issonnette (Dare to Care), Jean-Olivier Bégin, Alex Castillo Vasquez, Michel Rivard, Andréanne A. Malette, Francine Raymond, Patrick Norman, Geneviève Côté (SOCAN). 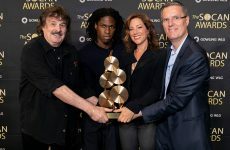 A who’s who of songwriters, screen composers, music publishers, and major players in the Québec music ecosystem gathered at Montréal’s La Tohu for the 29th edition of the SOCAN Montréal Awards, with more than 50 trophies presented during an evening celebrating Québec’s creative talent. Hosted for the first time by Pierre-Yves Lord, this year’s SOCAN Montréal Awards was highlighted with an all-female complement of SOCAN Classic Song creators, including Laurence Jalbert, Francine Raymond, Marjo, Lara Fabian, Marie Carmen, and Hart Rouge, who, alongside their co-writers and publishers, received one or more of the awards. 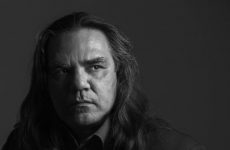 SOCAN presented several Achievement Awards during the Gala, including the SOCAN Cultural Impact Award to Michel Rivard for “La complainte du phoque en Alaska,” written in 1973 and performed by his band Beau Dommage. Grand Dame of country music Renée Martel, was deeply moved to receive the SOCAN Lifetime Achievement Award for her 65-year career. 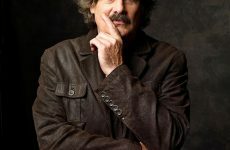 Jim Corcoran received the SOCAN Special Achievement Award, saluting his work as an ambassador of Francophone music on the CBC Radio show À propos for more than 30 years. Tire le Coyote offered a great performance, interspersing two Corcoran songs were with excerpts from his brilliant show. Patrice Michaud received the SOCAN Songwriter of the Year Award, and Jean-Olivier Bégin, the SOCAN Screen Composer of the Year Award, while Arcade Fire and Latin American music prodigy Alex Castillo Vasquez shared the SOCAN International Award. Dare to Care won the SOCAN Publisher of the Year Award, recognizing the success of their roster and positive influence on the Québec music scene. 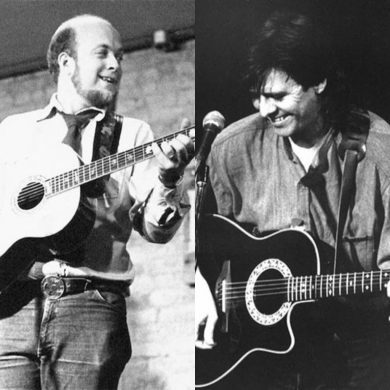 In the specialized music categories, jazz was honoured with the Hagood Hardy Award, going to Chet Doxas; the Jan V. Matejcek Award for new classical music was presented to James O’Callaghan; the Country Music Award went to veteran of the music scene Patrick Norman; international sensation Snails, won the Electronic Music Award; and Loud received two honours – the Urban Music Award and the Breakthrough Award, the latter of which he shared with the phenomenal Hubert Lenoir. Ten awards were presented throughout the evening for the most-played Francophone songs of 2017, including Patrice Michaud’s “Kamikaze,” Daniel Bélanger’s “Il y a tant à faire,” Andréanne A. Malette and Manuel Gasse’s “Fou,” Vincent Vallières’s “Badluck,” and “Du bonheur dans les étoiles,” co-written by Marc Dupré, Nelson Minville, and John Nathaniel. 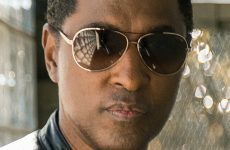 The gala also saluted the exceptional contributions made by screen composers and music publishers to the music industry, and the economy at large, by. 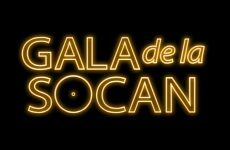 Among the evening’s winners were Montréal SOCAN Awards regulars, Anthony Rozankovic, and his publishers, Cinéflix Média Inc., as well as ole Media Management, which received the Music for Television (International) Award, as well as the Television Music Award, Fiction, for Mayday. Screen composers Jean-Phi Goncalves (Le tricheur), Scott Price (Gags), Sébastien Watty Langlois (Salmigondis), and Rudy Toussaint (How It’s Made) all left the gala with a trophy for the second straight year. Marc Ouellette, Luc St-Pierre, and Les Éditions de Musique JB collectively received the Film Music Award for Amber Alert/I Have Your Children. The contribution of SOCAN’s businesses that use licensed music in Québec was celebrated with the SOCAN Licensed to Play Award, going this year to the City of Longueuil. 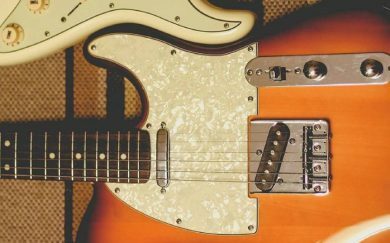 The city was rewarded for its recognition of the role of music in its community, and for its commitment to fairly and legally compensate the music creators and publishers. 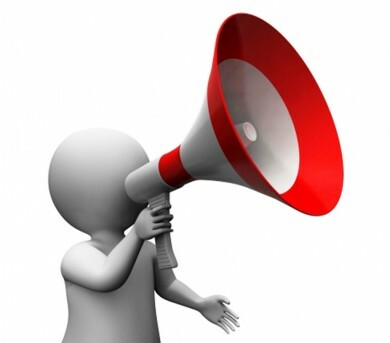 SOCAN congratulates all of our winners!